The Podiatry Institute is a non-profit (501c3), educational foundation whose mission is to be a supportive, global network of members, colleagues and friends, which enhances the quality of life for patients with foot, ankle and leg disorders through innovative education, research and service. 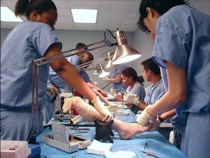 This podiatric residency program is considered to be one of the finest foot surgery training programs in the world. 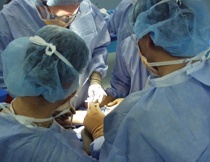 The faculty members all serve without compensation, and are committed to ongoing education in foot and ankle surgery. To meet this commitment, The Podiatry Institute hosts numerous domestic and international meetings annually, with attendance of over 3,000 podiatrists. All revenues generated during the year are returned to the process of developing and producing audio-visual materials, textbooks, and other industry-leading educational information. The Podiatry Institute has achieved national and international recognition for its leading role in developing and advancing podiatric medicine and surgery.